This introduction to the interpretation of Luke encourages in-depth study of the text, and genuine grappling with the theological and historical questions raised, by providing a critical assessment of key interpreters and interpretative debates. It draws on a range of methodological approaches (author-, text- and reader-centred), as complementary rather than mutually exclusive ways of understanding the text. It also reflects the growing scholarly attention to the reception history of biblical texts, increasingly viewed as a vital aspect of interpretation rather than an optional extra. 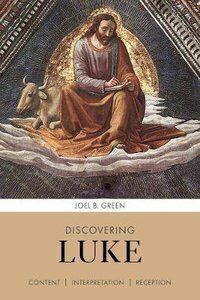 About "Discovering Luke: Content, Interpretation, Reception"
Joel B. Green (Ph.D., University of Aberdeen) is professor of New Testament interpretation at Fuller Theological Seminary in Pasadena, California. Prior to this he was dean of the School of Theology and professor of New Testament interpretation at Asbury Theological Seminary. He is the author or editor of numerous books, including the Dictionary of Jesus and the Gospels; 1 Peter (The Two Horizons New Testament Commentary series), The Gospel of Luke (The New International Commentary of the New Testament), and Recovering the Scandal of the Cross with Mark D. Baker. He is preparing the forthcoming replacement volume on The Acts of the Apostles also in the NICNT series and James in the New Testament Library. Expected to ship February 2020.